My 83 year old dad has been a Christian minister most of my life. I thought back to when I was a child, how even our neighborhood winos respected my dad; partly because he was a true man of God, but I believe mostly because dad respected them. Dad always greeted everyone with a smile and a cheerful, "Hello, how ya' doin'?" Though well versed in the Word of God, dad's character and attitude were his greatest sermon. The winos would aggressively protect us "HEY, that's one of Reverend Moccasins (Marcus') kids, leave 'em alone!" I was around twelve years old when our family, mom, dad and four younger siblings, moved out of a Baltimore city government housing project into our home in Pumphrey, Maryland; a black suburban community. Upon our arrival to Pumphery, the overgrowth in our back yard was at least six feet tall. My entire family tackled the jungle. An over six foot tall, powerful, leather skinned, hard hands, old working man appeared with a huge sickle. He introduced himself and led the charge in conquering the overgrowth. We later learned that our helpful neighbor, Mr Charley, was famed as the meanest man in the community. Mr Charley was quite outspoken about his disdain for preachers and church folks. And yet, he respected my dad. Dad and "Mean Old Man Charley" became good friends. Dad, a young preacher with a wife and five kids needed a whopping $110 for his tuition at Baltimore School of the Bible which was not affordable for my parents. Without dad asking, Mr Charley showed up with a big jar containing $110 in dimes for dad's tuition; such generosity from a man who claimed not to "cotton to" preachers and church folks. There were two fine churches in Pumphery; the Baptist Church and the Methodist Church. But, our family attended a tiny storefront church in the ghetto of east Baltimore city where dad was assistant pastor. When hurricane Andrew devastated Pumphery with water four feet high in most resident's homes including ours and to the rooftops of others, the community sought out my dad for leadership. Folks knew they could trust the character and leadership of Reverend Marcus. As a kid, I remember cleaning mud out of neighbor's homes and dad, with my brother David, rescuing people from their rooftops in a small boat. Dad also worked with the Red Cross coordinating relief efforts, assisting neighbors with paper work and etc. Watching my dad prepare his sermons taught me a valuable lesson about "putting in the necessary work and effort" into whatever you set your hands to do. Dad would prepare his well thought out, researched and entertaining sermons in his "official study," our living room. I remember as a little boy, on many occasions, sitting on the front row in tiny churches, enjoying dad's passionate delivery of his sermon to as few as five people. Dad grew to pastor several large churches during his 50 years in ministry. He retired for a few years, but was called back by the conference. Today, dad is Dr./Rev. 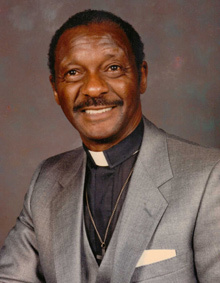 Lloyd E. Marcus, author and pastor of four churches. Dad, now 83, called me the other day with a question. Due to my 15 years in television broadcasting, he assumed I would know. "How much do they pay people to come on the Springer Show and humiliate themselves?" I told dad Springer guests are not paid. They come on the program simply to be on national TV. Shame is a thing of the past. Dad was stunned. I am extremely grateful that at 83, the dad I have admired all of my life is "still here"; as sharp, witty and upbeat as ever. Dad still has a great baritone voice. I thought, "Wow,what a tremendous blessing." My singing career began at age 9, singing solos in dad's storefront church. When I became a teenager, dad and I sang together in a gospel quartet. I am flying dad down from Maryland to Deltona Records in Florida. We are going to record a duet to go on my upcoming Christian music CD. I can hardly wait. Happy Father's Day dad. I love you.